Frugal and Thankful: A few of my most favorite non-essentials in the kitchen. A few of my most favorite non-essentials in the kitchen. And I know it's a small and unnecessary thing but I, again, I found it very useful. 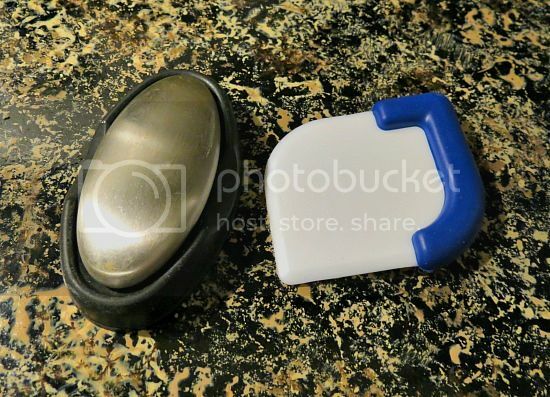 Last summer I went to Bed Bath and Beyond to pick up a wedding gift for my friend when I noticed a little plastic thing called a "pan scraper". I was intrigued. I think, we all had times when we struggled to get rid of rough, stuck, burned on food from our beloved pots and pans. Let me tell you, my friends, this thing is magic. It makes the kitchen job so much easier! And it doesn't scratch the surface of your beloved pots and pans. It was worth every penny of the 99c I spent on it. OK, that's an absolute non-necessity but aren't they just super-cute? :) My sweet neighbor gave them to me for my Birthday, and every time I use them, they put a smile on my face. It's nice to have something so cheerful that you use all the time in the kitchen. Now your turn :) Tell me, what do you have in your kitchen that others might find unnecessary but you absolutely love? Or are you a minimalist when it comes to your kitchen cupboards and drawers? I have a couple of those pan scrapers too- given to me by a friend- aren't they the best! One of the things I love is a big ceramic pasta bowl that my grandmother made for me while taking a ceramics class in the nursing home. It is huge and takes up a lot of space in my cabinet but I love it- I make sure I use it every time I bring her home for the day so she can see how much I love it. Oh, that's not a non-essential, that's a family treasure :) I would totally keep it too! Apple cutters are VERY helpful... I remember cutting up the apple and just throwing the pieces in with a container of strawberry yogurt. Talk about the best afternoon snack ever! 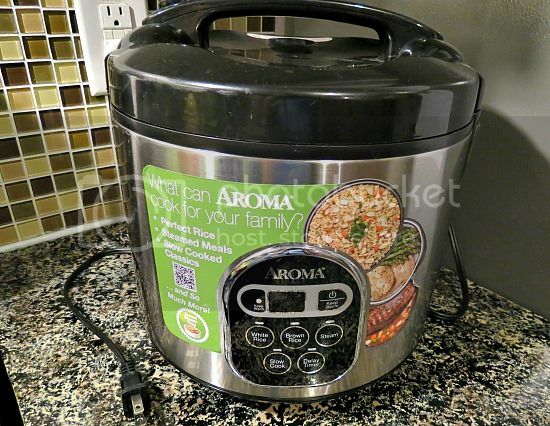 I've always thought about rice cookers, but I think I'd get disowned if I ever got one... rice is an essential food from back home that if you dont know how to cook, you have no business in the kitchen (dad's word, and even he messes up the rice someetimes!). The odor remover is interesting, but you can get the same effect with a stainless steel tool (like a serving spoon or a knife). We use garlic a lot, as well as onion, so it helps get through the day. Love the bumble bee measuring cups. AS far as our non-essential tools... I have a salad spinner. Call me frivolous (even though it's the $40 model that I got for $10! ), but all I eat for lunch when I can eat lunch, is salads. And it takes so much out of the prep time instead of washing, shaking, then wrapping on paper towels to remove moisture. 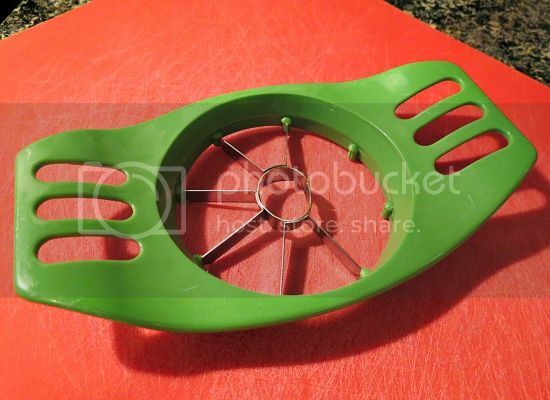 Oh, I have a salad spinner too! Actually, we got it for our wedding and I was the first to say, "What a waste of money!". We haven't touched it for two years, and then I got a bunch of very dirty spinach, so I decided to try it... Now I'm in love :) Such a time saver! 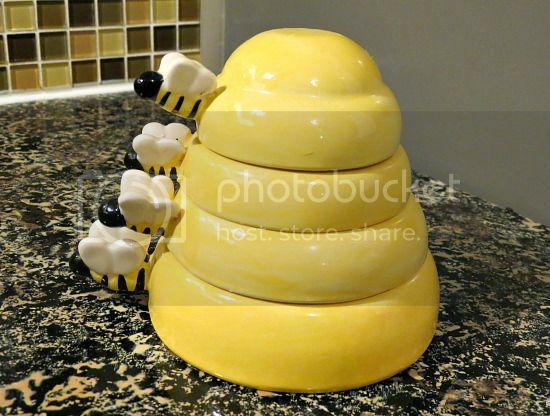 I love those bee measuring cups. I bet my son's teacher would like them too, for the classroom. She's got a bee theme going on. I probably have a lot of non-essentials. I don't use my apple cutter much, but the kids like it. I like my food processor because I hate shredding cheese. Is that a non-essential? We have a drinking glass that was part of a McDonald's promotion several years ago with characters from Shrek imprinted on it. I'm not quite sure why we only got one (we have 4 kids), but child #3 thinks that glass is his exclusively. He gets really frustrated if someone else uses it! You are not the only one who loves their apple corer. I have always found them more trouble than they are worth being difficult to use and leaving too much core at times. I wonder what I'm doing wrong? I am nowhere a minimalist in my kitchen. I will agree with you about the apple corer/slicer. Love mine, but I am a dish hog. I own and use on a rotating basis 9 sets of dishes. Yes I know it is excessive and unnecessary, but I love having them and using them. Several of the sets coordinate with several other sets, so I get different looks daily. I have even been known to cut out seasonal shapes and "glue" them to the underneath side of my clear set to create a totally "new" set of dishes. If I did not have a butler's pantry in my home this obsession would be entirely impossible. Does this qualify me for an episode of "Hoarders"? I have this same pan scraper and love it for my 3 year old! She can cut up her own bananas and hot dogs with no worries about cutting herself!